Altium recenlty announced an open beta program for its community-driven PCB design tool. CircuitMaker is intended to address the unique needs of the electronics maker and hobbyist community with a free software offering. Anyone interested in participating in the open beta can register now at CircuitMaker.com. 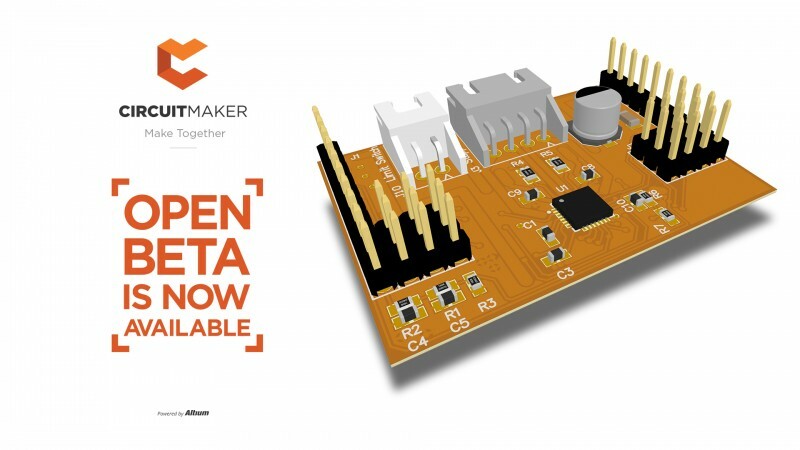 The open beta testing program enables designers to immediately download and begin using CircuitMaker while joining a collaborative electronics design community. The open beta process will also provide feedback and input to refine CircuitMaker. Comprehensive PCB design technology — Built from the foundation of existing Altium technology, all of the typical features needed for modern PCB design are built in to CircuitMaker. This includes schematic-PCB integration, interactive routing, and output generation tools. Advanced community collaboration — With CircuitMaker, designers have the opportunity to collaborate in a community-driven design environment, with unlimited access to contributed design and component data. This collaboratively design process is made possible by combining an advanced, cloud-based platform and an industry-standard user experience in a native application-based design environment. Streamlined interface — CircuitMaker is a native application, and provides a streamlined interface, allowing new and casual designers to create designs quickly. This removes the traditional, time-intensive learning curve usually required for new PCB design tools. Open beta registrations for CircuitMaker begins today, and is freely available worldwide to all interested electronics designers. Those interested can register now for the open beta at the CircuitMaker website.